It’s 2070. After almost thirty years of absence and presumed dead, Byron has come back from Gnosson to save Earth’s humans from impending extinction. True, he’s no longer human and far more powerful that any vampire, but the task won’t be easy. When human, he had been the sickly, socially awkward scion of a lineage going back all the way to Charlemagne and Theodosius II, only child in a loving if very unusual family of archaeologists, willing to sacrifice everything for him. Since childhood this ranty, opinionated French count would travel the world and endure the unendurable at the best genetic therapy clinics, doggedly clinging to life. Against all odds, he would follow on his parents’ footsteps and risk it all at tombs and buried temples, in remote and lawless places, collecting priceless artifacts and amassing beyond fabulous wealth. But one day, at Death’s doorstep in one of those digs, he’d meet Trann—‘not exactly’ a vampire ghost—, who would offer him a bargain no self-respecting archaeologist could refuse. Then he’d suddenly wake up amnesic, in a strange dungeon where no one would seem to understand him, and almost go insane; a place of Egyptian gods who look like vampires; a place where time appears not be linear—and he, suddenly and inexplicably, in perfect health. After earning his freedom, having found his rightful place among the Librarians, he would embark on the most unusual archaeological expedition and vampire hunt of his life—fulfilling, while doubting it, a Prophecy as old as the Covenant of Gnosson itself. Of course the book didn’t emerge from my head fully grown and armed for war like Athena from Zeus’ head. After years of reading about ancient civilizations, notably Egypt and Mesopotamia, I develop a certain fascination with archaeology and how essential the preservation of Humanity’s past and memory is to ensure a better future for all. I also grew up learning and admiring all things French, from the language, philosophers, history, the cuisine, to so many other things it would be tedious to enumerate. And at the same time, as our multilingual family living away from the big city, I became acutely conscious that nature is not indestructible and its demise should lead to that of our species. Given my scientific background I hope not to be faulted for ignoring attempts to ignore man-made global warming and pollution, and their potential to cause our species’ extinction. After reading substantial literature, call me biased, but I’ve also realized science needs not to believed—for example, anyone who decides not to believe in Newton’s gravity equations could help prove Darwinism right by choosing to jump over a cliff. On the other hand, ever since I could read, I’ve loved science fiction, fantasy, adventure—especially that which more extrapolates science that wiggles magic wands—and, like many, wished we humans could live long enough to see if any of the more far-fetched predictions of the genre come true. For example in 1956 the president of IBM had predicted that by the year 2000 there could be as many as six computers in the world. In 1932 at Berkeley, CA engineers were convinced the car had attained its final form. So, will we ever travel at beyond-light speed? Since being able to see that would require living for centuries, I ended up developing an interest in vampires and read a few masters of the genre, who enlightened me on this hunter-prey relationship seen from the other side— but also, on the philosophical problems that such beings would have to tackle, should they have a sense of right and wrong. All of the foregoing has converged to, over many years, lead me to write ‘Vampires of Gnosson’. Over years trying to, as some would say, never let the truth get on the way perhaps? I’ve always admired the peculiarities of old French gentry. Some like Gay Lussac contributed to science but lost their head in the Revolution, anyway. Gilles de Rais on the other hand, having been a companion of Jeanne D’Arc was a monster—the closest France has been to someone comparable to Vlad III Tepes the Impaler, the real Dracula. So I wanted someone closer to Gay Lussac or glamorous and filthy rich like Louis XIV’s Nicolas Fouquet than to Gilles de Rais to have the wherewithal and so go all over the place; and yet it had to be somebody who may, following Byron’s odyssey eventually end genuinely caring about the anonymous crowd. As Byron’s family life goes, my own grandmother was an adorable matriarch and my parents, while not archaeologists were multilingual, nature lovers, nurturing and quirky, and true ancient history buffs. Librarians emerged from past struggles between science and dogmatism, say Gore Vidal’s ‘Julian’ and Umberto Eco’s ‘Name of the Rose’, adapted to mid-twenty first century—and of course, with a sci-fi twist. There are also a variety of secondary characters more fully explored in upcoming volumes of the saga, which deal—I believe—in a novel way, with vampires and Darwinism, and a possible Holocene Extinction Event. Ancillary characters emerged for the sake of the plot’s consistency, and/or trying to round off the main character, Byron de Foehn de Groslac. But one day, at Death’s doorstep in one of those digs, he’d meet Trann—‘not exactly’ a vampire ghost—, who would offer him a bargain no self-respecting archaeologist could refuse. Then he’d suddenly wake up amnesic, in a strange dungeon where no one would seem to understand him, and almost go insane; a place of Egyptian gods who look like vampires; a place where time appears not be linear—and he, suddenly and inexplicably, in perfect health. 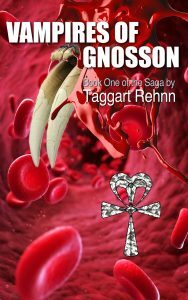 After earning his freedom, having found his rightful place among the Librarians, he would embark on the most unusual archaeological expedition and vampire hunt of his life—fulfilling, while doubting it, a Prophecy as old as the Covenant of Gnosson itself.